February 11, 2010 the fashion world lost a rare talent in (Lee) Alexander McQueen, founder of the Alexander McQueen and MCQ fashion labels. 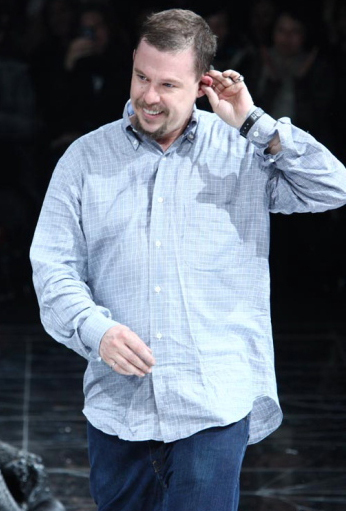 At just 40-years old, Alexander McQueen achieved many accomplishments in fashion including working for Romeo Gigli, head designer of Givenchy (1996-2001) and four time winner of the British Designer of the Year award (1996, 1997, 2002 and 2003). Rather than focusing on his death, I prefer to highlight the last artistic gifts this talented designer left us. McQueen's next to last menswear collection never made it to the catwalk. Instead, the 24-piece collection was shown via presentation for spectators to gain a more personal view of each ensemble. This spring/summer 2010 collection seemed to depict the life of a hardworking man in light impeccably tailored business suits for the weekday converging to paint splattered garments for after work and the weekend. Perhaps his most tongue-in-cheek pieces were the navy suit and white button down dress shirt with navy slacks that had not so inconspicuous hand splatters covering each side of the chest and one over the crotch. With the color pallet of the spring 2010 season taking on aquatic hues, McQueen pushed the envelope to make his entire spring ready-to-wear collection a theatrical underwater explosion. According to a press release statement reported by Style.com, the collection represents a post-apocalyptic world where evolutionary life goes back to where it began, the sea, due to the melting of the polar ice caps. Think a of The ecological impact from The Day After Tomorrow, the world's submergence in water in Waterworld and the beautiful alien-esque imagery of Avatar and you will have the overall feel of this collection. Celebrities such as the theatrical Lady Gaga and Rhianna, both of whom are Alexander McQueen fans are best suited for the designs from this collection. If you are the daring artsy type who frequents nightclubs a few of these pieces may be right up your alley such as the black leather fringe mini (slide 35) and his sea urchin-look mini dress worn by model Karlie Kloss (slide 26). To view the collection in it's entirety visit Style.com for the runway slideshow. The last showing from Alexander McQueen is his fall 2010 menswear collection. An ingenious collection of reptilian prints, the paint and chalk carryovers from his spring 2010 menswear collection and accessories reminiscent of a crime syndicate of death. Muted, smoky hues were mainstream in this collection with fur accents and trousers that looked like stirrups. The most shocking piece of the collection was a cable knit sweater with a skull and crossbones design knitted into the fabric. Add on the facemasks, which varied from looking like the men were about to pull a heist to partial face coverings that looked like surgical facemasks, and you have a touch of noir added to the mix. The PUMA and his last three collections (two for the upcoming season and one for the next) are the final artistic delights Alexander McQueen has left the fashion industry and the world. The fashion world will miss its iconoclast genius and this designer/writer will as well. For me, Lee Alexander McQueen filled a void after the death of the man whose work inspired me to become a fashion designer, Gianni Versace. McQueen showed me that it is ok to take risks in design and to be a visionary. McQueen showed me that you do not have to push out the same designs with a few tweaks here and there to sell. McQueen, along with others, gave hope to the costume designer in some of us that our work can be high fashion and not just a passing fad. 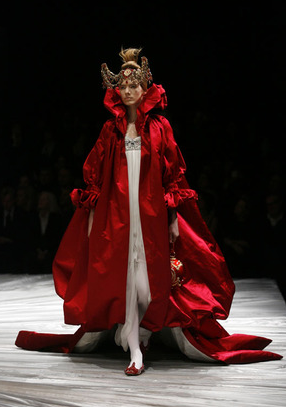 Lee Alexander McQueen, I miss you already.